1) Cut the 12" length of cording into two 6" lengths. Fold each of the lengths in half and then thread the folded half through the front of the link and make a lark's head knot with each. 2) Bend the cross link with your hand so that there is a slight curve to it. 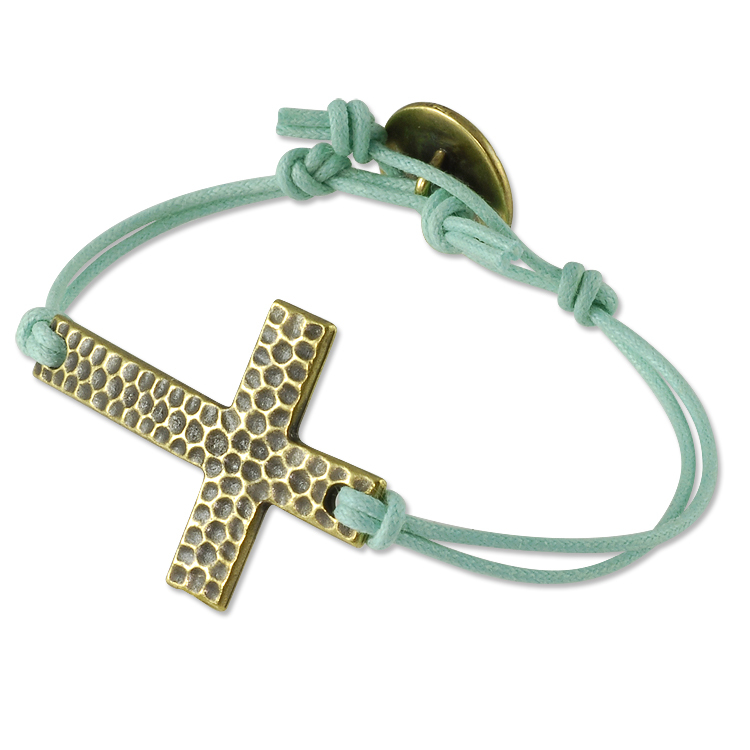 Place the bracelet onto your wrist to gauge where to make the knot to attach the button. Remove the bracelet and make an overhand knot on this mark. Slide the button onto one of the cording lengths and then make another overhand knot to secure the button in place (don't make the overhand knot right next to the button shank, allow there to be about a 1/2" space for wiggle room). 3) Place the bracelet back onto your wrist and visually mark on the other half of the bracelet where the two remaining overhand knots should go. Make the first overhand knot and then make the second about 3/4" up. Test the bracelet out and make sure that your knots placed correctly. If they're not then adjust. If the knots are perfect, trim up the cording ends and you're done!